army of the undead, resurrected by a freak toxic spill. I knew all of the LucasArts titles, but I guess not. every aspect except perhaps the sound. This game is awesome. Reminds me of chaos engine oddly enough. But it's more fleshed out. It's funny too. You get weapon upgrades and much more to kill zombies. 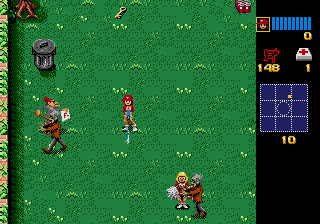 It's even better than the snes version. Heh, some funny spoofs you will notice, like jason, chucky, and more. I highly recommend you play this game two player, it's tons of fun. It's also very hard. A classic! 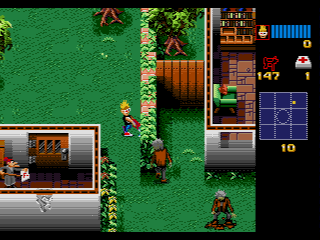 On a side note, JVC released a sequel to Zombies ate my Neighbors on snes called Ghoul Patrol. It's not as good, though it does add jumping. 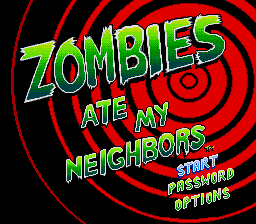 I give Zombies ate my neighbors a 9. Great easy game......... YHEA RIGHT! This game is toughter every stage! But you gotta save your neighbors... welll.....maybey..its a nice thing to do!! 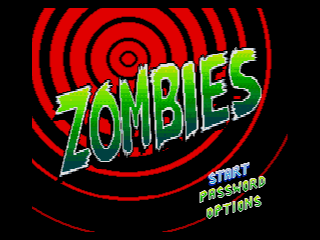 its has a fun spin-off of a lot of horror movies! Chucky, Jason, and a few more... Irs a blast for game and movie fans alike!! anyone hear of Ghoul Patrol...??? 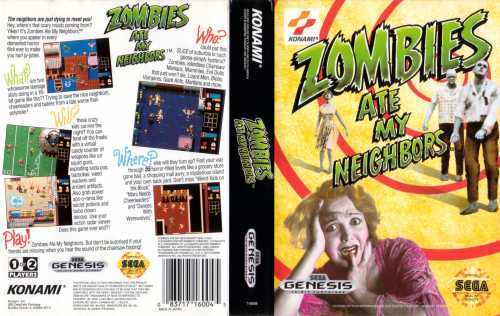 you should have considering it is the legitimate sequel to this mega hit...if you wonder why it feels a little "odd" thats cause the original programmers were not hired to work wonders on this one! have fun AND WE CAN JUMP NOW! 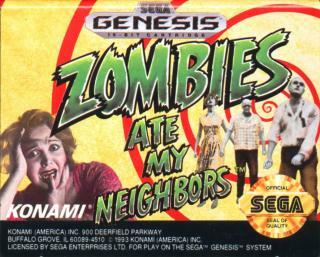 it's a good game, they should of made a sequel, it would of sold out on the first day.